Recently tried a smart phone app called Calimoto. 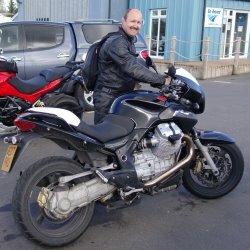 It is intended for motorcyclists and for me very intuitive to use with lots of well thought out functions that we like. The fully functioning app is £40 a year or all the maps for £5 a week ( just get all the map options for the holiday only. I downloaded the free southern England map just to see how it worked and I'm thoroughly impressed, it's round trip option picked out some cracking roads and it's so easy to adjust the route too. But can buy a bike and that's pretty close! I've tried Waze.....probably a great A to B app but not as easy for me to take the fun roads. My current sat nav a Tom Tom 400 is ok for a A to B kind but for fun rides it's got to Calimoto.